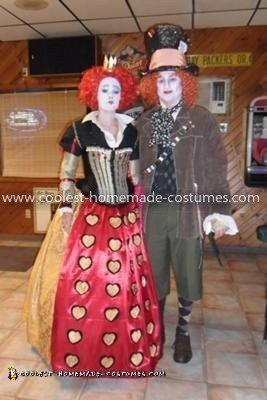 We both love Halloween but it was our first one together so we went all out and made these Homemade Mad Hatter and Queen of Hearts Costumes. .
For Mad Hatter I got his jacket, vest, and pants and a second hand store. 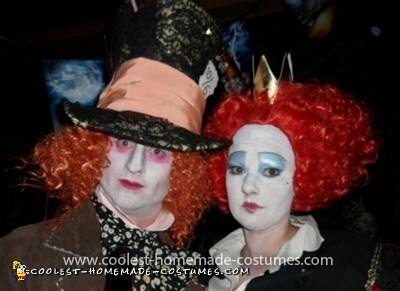 His hat I bought a really cheap Mad Hatter version and then covered it in black lace, burnt the edges, added the ribbon and made the pins to exact detail. On his pink shirt underneath we added long lace trim to fall over his hands and pin cushion ring. We bought his mismatched socks and second hand shoes. We painted his nails white and ‘old looking’ and then of course his awesome makeup! We cut off a little hair from the underside of the wig and spirit gummed them onto his eyebrows for a realistic look. All together we probably spent about $100 but the costume was exact! The most expensive item was definitely the movie quality wig. For Queen of Hearts I really the wanted the “Big Head” look. I bought the wig online but then put on a bald cap so I could sit the wig on my head much further back. The undershirt was a white blouse I had at home and I simply starched the collar for it to stand up straight. The black shirt was a second hand find that I hot glued and sewed ribbon and material on to create bands on her arms. The corset was my favorite. I bought this off of eBay and glued on material, used ribbon, white pom pom trim and beading to add the details. The skirt was actually a very simple (but time consuming) fix. I bought a gold table cloth, folded the top edge to create a pocket in which I could put a belt through it. This way it fit any waste size. I added the red satin panel and cut out each heart and hot glued them on. I then purchased a hoop skirt on eBay to make it nice and full. Down to the last touches that you can’t see. I had black ankle boots on that had gold material over them, then I put on black lace over that and even had a heart charm hanging from the buckle! I also had black and white thigh highs on that had a red heart on them at the top. My make up was my favorite part. 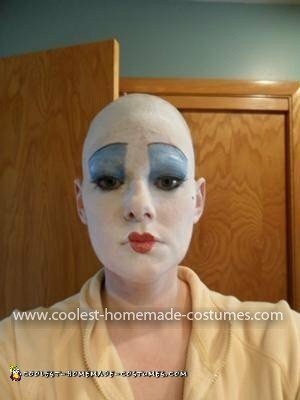 I actually used a glue stick to ‘spackle’ down my eyebrows nice and smooth so I could move my eyebrows much higher on my head. Of course, the heart lips were key! We had every ring, every ribbon down to the detail. The costumes did take months but it was so well worth it! Saw this costume in person…still in shock of how realistic & awesome it was! Great job Michelle & Jeremy!! !